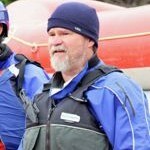 Neil is a born and raised “Mainer” and has over 24 years of guiding experience. When he isn’t hitting the rapids with guests or exploring trails behind a team of sled dogs, he can be found in the classroom sharing his knowledge of science with students. 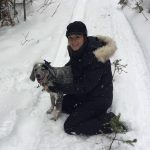 Emma is Muddy Paw Sled Dog Kennel & Raft NH’s office manager, she has been with the company over six years and is prepared to answer all your questions! When she isn’t on office duty, she can be found playing with her Australian cattle dogs Roxy & Gus. Born and raised in the White Mountains, Wes is a true local who is happy to answer you questions about the area. Wes is a licensed Maine whitewater raft guide and senior musher that has been part of the two-legged team here at Muddy Paw and Raft NH for 4 years. 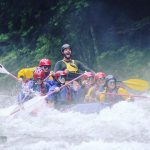 Hannah is a fourth-year white water raft guide, crazy dog lady, and dirtbagging enthusiast. 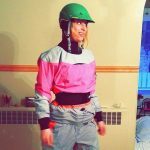 Formally a chef with a real job, she quit “all that regular people stuff” to live out of a tent, or truck, or sometimes her in-laws house, and pursue her love of guiding others in outdoor adventures. 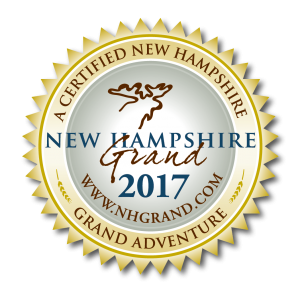 She is a Registered Maine White Water Guide, with experience guiding in Maine, New Hampshire and Pennsylvania. Her hobbies include, but are not limited to: knitting, trying to play the banjo, unicorns, occasionally brewing her own beer, restoring vintage campers, fly fishing, sled dogs and trying to cook gourmet food over an open fire. Hoping to one day open her own dog rescue, Brianna joined the Muddy Paw team about 5 years ago. Don’t let her small stature fool you, Brianna is able to control a team of sled dogs and wrangle water buckets bigger than she is. 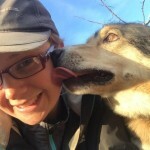 When she isn’t at the kennel looking after her four-legged friends, Brianna can be found enjoying … just kidding this passionate and committed gal is pretty much always with the nearly 80 sled dogs that currently call us home.